Totem Destroyer Redux is a physics puzzler game. The new Totem Destroyer is here. Your mission is to destroy the totems without letting the golden Idol, fall into the ground. Use balance to keep it up. Eliminate blocks as directed, without letting the idol fall. Because he will be very, very angry. 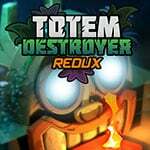 Totem Destroyer Redux Game is one of our Puzzle Games at Round Games. It also tagged as a physics game. To play even more free games, view our most played and all games pages. If you want to play more games like this game: Then you can simply check out the games inside the game tags that are the most relevant to your interests or check the Puzzle Games category or check the related games section at the end of the game page. Also make sure to check out ClickThePlay Game, you may enjoy playing it.